A chain collision involving a hit-and-run lorry and two cars along Ang Mo Kio Street 44, towards Avenue 10, on Sunday night (March 25) left one man injured. The police told Stomp that they were alerted to the accident at 9.33pm. According to Shin Min Daily News, the lorry, believed to be travelling at high speed, had been turning into the aforementioned street when it hit the right-side mirror of a stationary Toyota Altis by the roadside. The lorry then collided with another stationary car, causing it to crash into a tree and 'Slow Down' road sign. The Toyota driver who works part-time for Uber, Mr James Ooi, told Shin Min that he tried chasing after the lorry driver, who reportedly left the scene instead of stopping. The 35-year-old, who had stopped by the roadside to pick up some passengers, said: "The passengers were badly frightened. I told them to wait for awhile and intended to exit my car to reason with the lorry driver. "However, the lorry driver did not stop and even hit a second car. 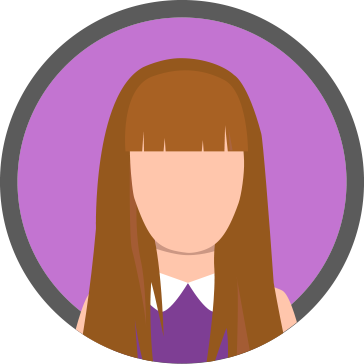 I immediately gave chase on foot for about 20 metres, but could not keep up." Stomp understands that the driver of the second car, a 45-year-old man, was conscious when taken to Tan Tock Seng Hospital. The impact of the accident caused his spectacles to break, which resulted in cuts on his eyelid and forehead, and nearly blinded him, reported Shin Min. Facebook user Michael Ng, identified as the driver of the second car who was sent to hospital, shared photos of his mangled vehicle at the accident site. His post included video footage from a witness, which shows the "lorry speeding away and mounting kerb after accident". 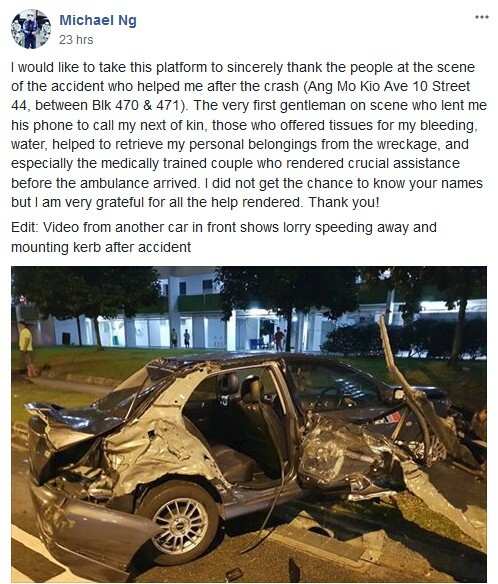 In a post made in the SG Road Vigilante Facebook group, Mr Ng also thanked those who provided their assistance below paramedics arrived at the scene. Mr Ooi told Shin Min reporters that following the crash, he saw Mr Ng bleeding non-stop and exiting his car to seek help before falling onto the ground. "He looked like he was in a lot of pain," added Mr Ooi. The commotion from the accident drew a crowd of around 40 onlookers.